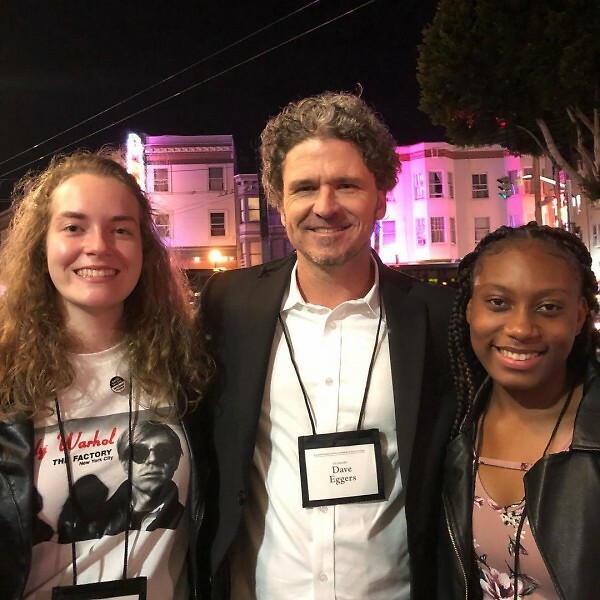 Two young adult members of the Grand Rapids Creative Youth Center participated in the inaugural International Congress of Youth Voices in San Francisco, August 3-5, 2018. Aliya Hall with activist Rep. John Lewis. 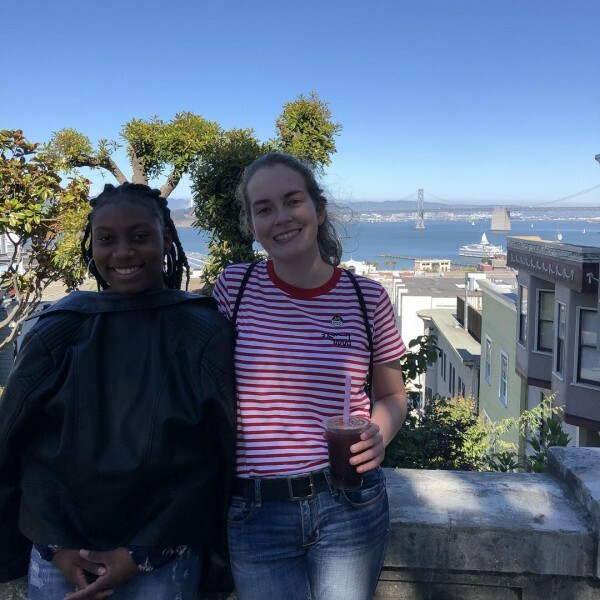 This month, Grand Rapids area students Maeve Wilbourn and Aliya Hall had the opportunity to travel to San Francisco to attend the International Congress of Youth Voices as student delegates. The young women were attending as representatives of Grand Rapids Creative Youth Center. The Creative Youth Center offers after school creative writing programming to Grand Rapids youth aged 6-18 at no cost to families. At the conference, the young women had the opportunity to meet authors, guest speakers, activists and writers from around the world. The list of those present include Chimamanda Ngozi Adichie, Khaled Hosseini, Jose Antonio Vargas and Dave Eggers. Wilbourn, 17, is a senior at City High. She writes short stories and calls herself an evolving writer. She plans to begin writing poetry. She first joined the Grand Rapids Creative Youth Center a year and a half ago. Hall, 16, is a sophomore at Godwin Heights. She writes about people’s relationships with each other, family, friends and bullying. She also likes to write poetry. Prior to arrival at the conference in San Francisco, Wilbourn admits something. “I started out with some serious imposter syndrome,” Wilbourn said. “There were people there that were my age, and some that are younger, that are planting a billion trees and suing the government and doing all this stuff. 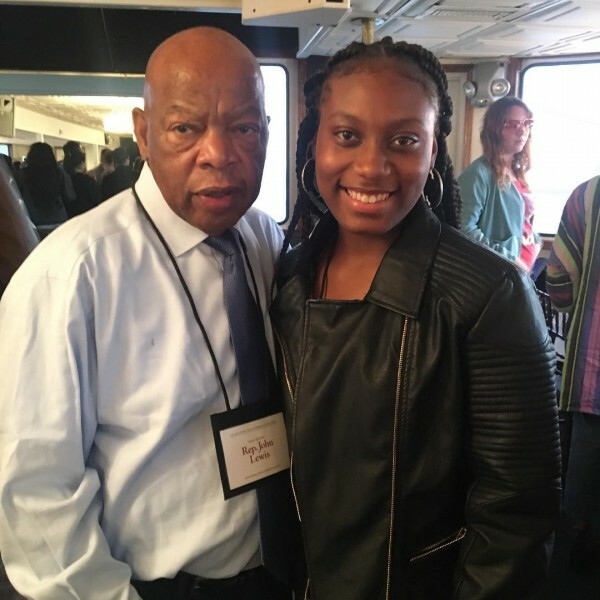 Hall said she learned something from nationally recognized leader, activist and U.S. Representative John Lewis that sticks with her. The women traveled with Brianne Carpenter, Creative Youth Center program director. Carpenter said the Creative Youth Center received an email from Dave Eggers asking if the organization would like to nominate two young writers who are also passionate about social justice issues to attend. “The idea was to unite delegates from around the world to spend a weekend together figuring out how to make a platform for youth voices,” Carpenter said. The International Congress of Youth Voices set an age limit of 16-21 in order for students to participate. Last year was the first year the CYC had full high school programming. Hall and Wilbourn are currently the only CYC students who fit in that age requirement. Happily, both are perfect for what the Congress of Youth was looking for, Carpenter said. “They are both fantastic, committed writers, passionate about different ideas and interested in doing different things, but a great fit for what the Congress was looking for,” she said. The cost of the trip was covered by the International Congress of Youth Voices, with the exception of airfare. Carpenter said all airfare expenses were covered by Creative Youth Center donors. The group got to stay an extra night and tour San Francisco. One of the highlights of the trip for Wilbourn was seeing the seals at Pier 39. Hall enjoyed spending time with new friends eating Chinese food at Spice Kitchen in Chinatown. In the future, when Hall is writing her nonfiction stories, she will now do more research, she said. She also wants to make sure she doesn’t throw her writing away because she doesn’t like it. “Maybe one day I can look back on it and expand it,” she said. Wilbourn, meanwhile, realizes she has more in common with the students she met than she thought.